Mom Paula is always willing to let us try different flavors, varieties, and brands of cat food as long as she believes they are good and nutritious for us. There are some brands we've eaten since we were kittens and we still eat a variety of those brands and there are some brands we began eating when we became adult ladycats. We admit, we haven't liked some of the food at all and sometimes, we will eat it one day and not the next (especially after Mom Paula buys a case of it). 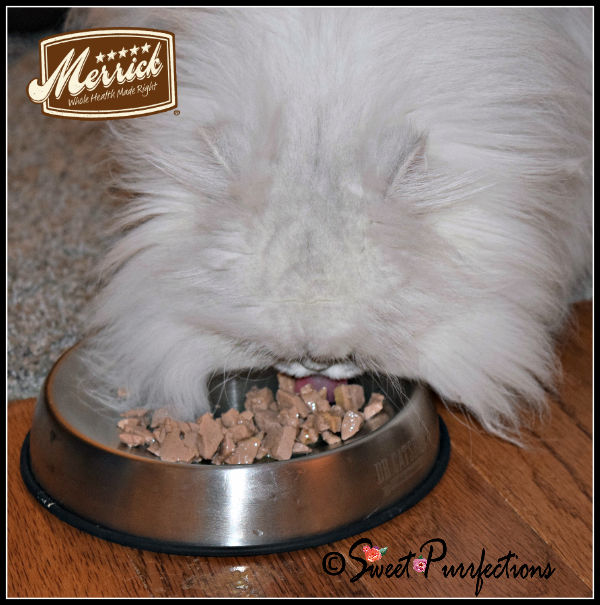 Disclosure: We received a variety of Merrick® cat food for free in exchange for our fair and honest review. Merrick is not responsible for the contents of this post. 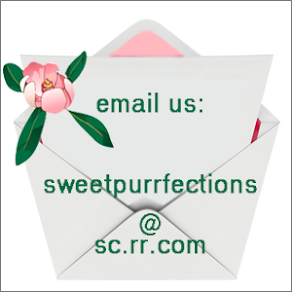 Sweet Purrfections only shares products and information we feel will be of interest to our readers. Merrick® is one of the brands of food we've eaten since we became adults. 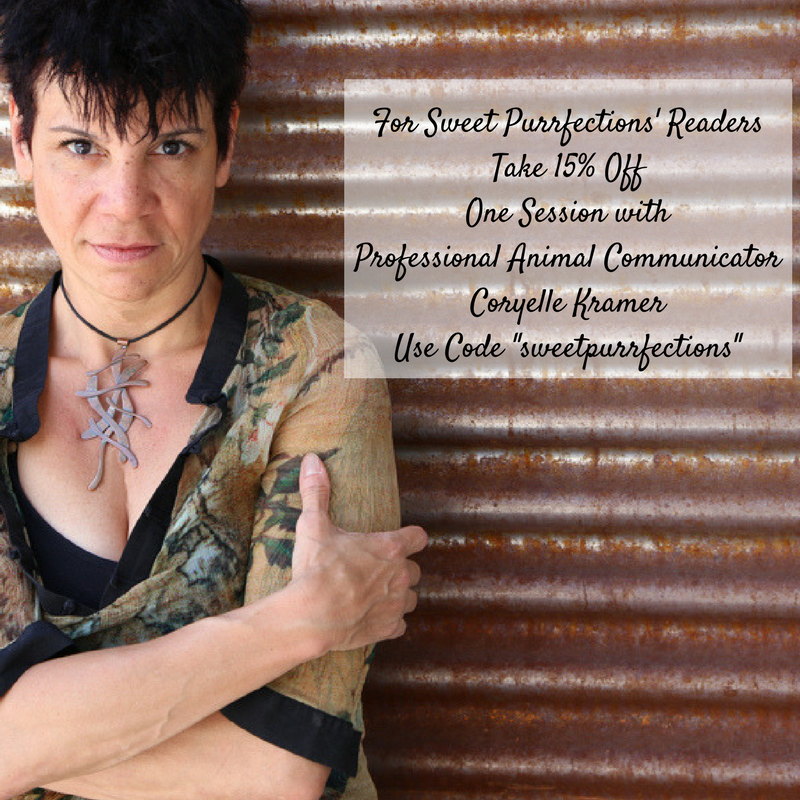 Mom Paula had fed Sweet Praline Merrick when she became so sick with cancer and wouldn't eat. Sweet Praline would eat the Turkducken™, Grammy's Pot Pie™, Thanksgiving Day Dinner™ and Mom Paula let us try it these when we were old enough to get away from kitten food. Truffle pretty much loved all of the flavors, but Brulee isn't a fan of pate', so we slowly moved away from this food for a little while. 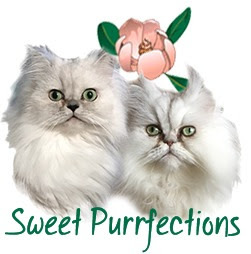 Mom Paula connected with the nice representatives from Merrick Pet Care at Global Pet Expo and BlogPaws this past year and they talked about the new varieties and flavors of cat food that weren't pate formulas. 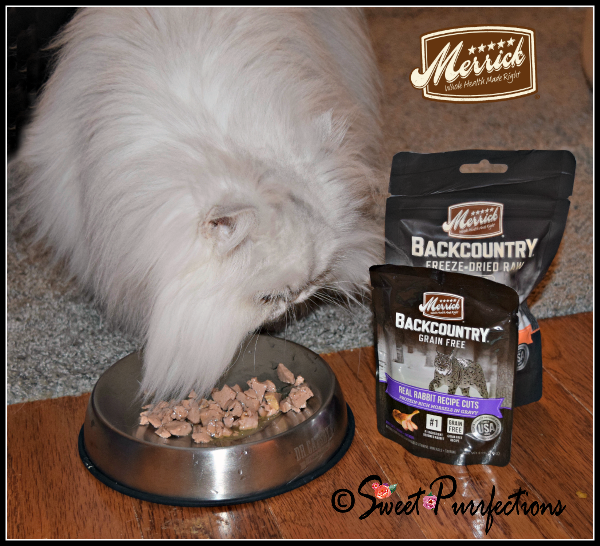 Merrick released the Merrick Backcountry® canine diet for dogs in 2015 and followed up this year with the Merrick Backcountry ancestral feline diet in both dry and wet recipes, as well as cat treats. 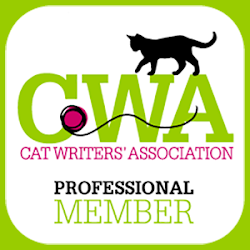 Both the dry and wet recipes and the cat treats are an all-natural, grain-free, and protein-rich and meet the dietary needs and wild craving of carnivorous cats. Merrick Backcountry is made in the USA and contains no ingredients from China. The wet recipes are in 3-ounce pouches that feature protein-rich morsels in gravy in six different flavors: rabbit, duck, chicken, turkey, beef, and whitefish. 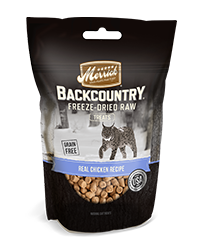 We like there is no carrageenan in the Merrick Backcountry cat food. We received a sample of each of the flavors and both Brulee and Truffle dove right into the rabbit. We don't get rabbit too often and don't always like the consistency. 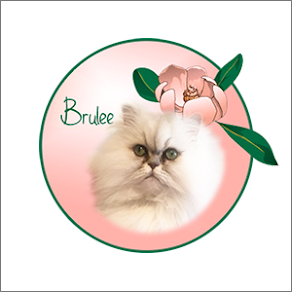 As you can see above, Brulee really liked this. Of course, she did like all of the gravy first and then ate the morsels. Mom Paula wishes it was a little more shredded to make it easier for Brulee to eat. Truffle licked all the gravy up and chomped (very lady-like) up the morsels. 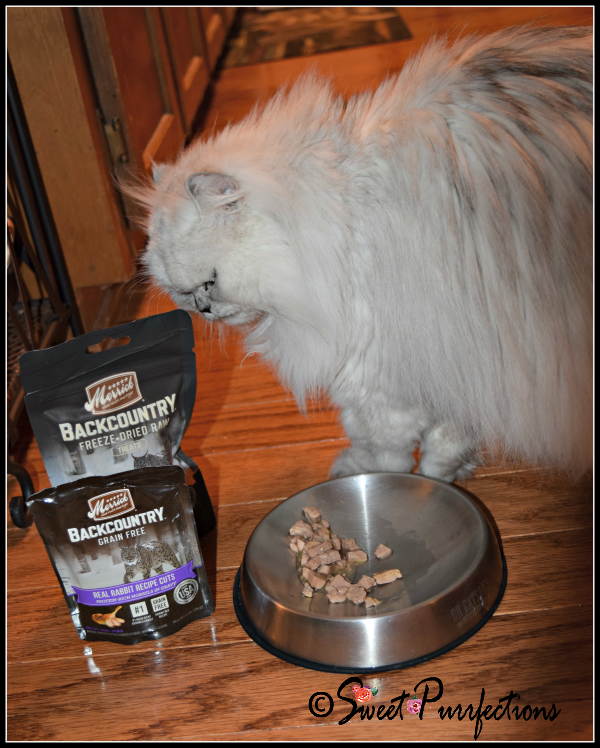 We also received some of the Merrick Backcountry Freeze-Dried Raw Treats. We've eaten other freeze-dried raw treats in the past with success and we loved these too. 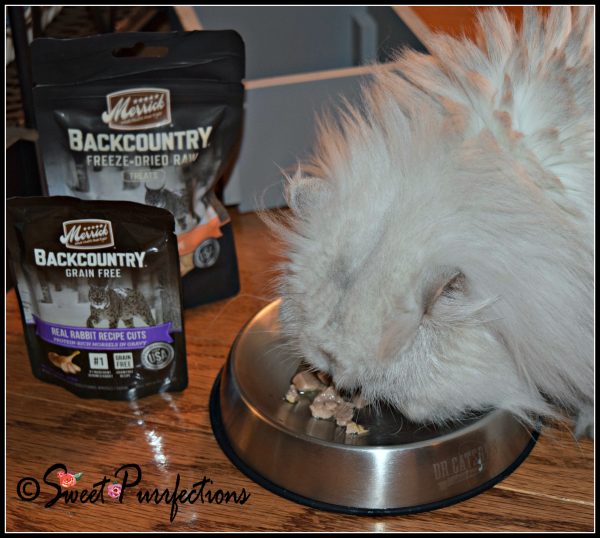 The all-natural Backcountry treats complement the kibbles and stews. Mom Paula has put these treats on top of wet food to entice Brulee to eat it when she's being her finicky self. Each freeze-dried raw treat features real, freeze-dried pieces of raw poultry or fish and they are completely free of grain and gluten. We get the treats straight from the bag, but your human may want to add water to them for extra moisture. 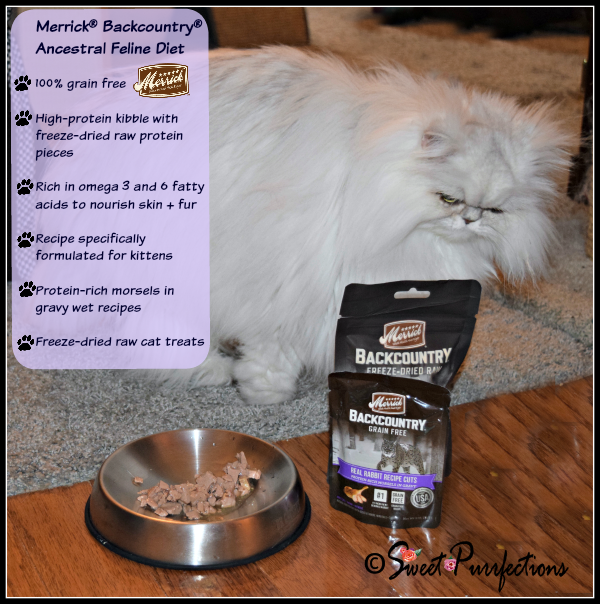 We highly recommend the Merrick Backcountry Ancestral Feline Diet for all of our kitty friends. It's nice to have Merrick back in our home. I reviewed the Merrick Backcountry too. I was sent the chicken flavor. 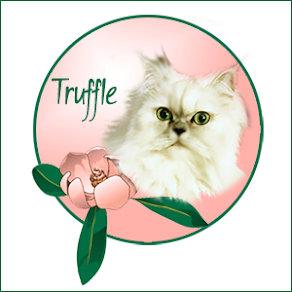 Looks like Truffle and Brulee liked it! I will have to give the moist food a try! We already have the freeze-dried treats here. We are happy that you like those foods. Now that Newton is going cold turkey off anything containing plant matter at all, we need to have a look at Merrick Backcountry's ingredients. 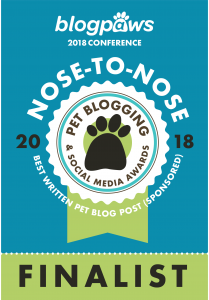 They may need to be added to our treat rotation! We will only eat moist food with a few treats sprinkled on the top. 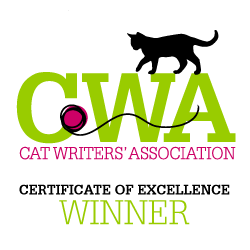 We only eat wet food and as we are very finicky we only like three flavours but our favourite one is chicken in sauce nom,nom, nom. We usually prefer pate foods, but these look pretty tasty. Merrick does make some darn tasty yum! The moist food sounds interesting to us. We should give it a try. I like the fact that they're grain free and have a nice selection of flavours. My cats have always preferred pate, because if you give them chunks with gravy they'd lick off all the gravy, and leave the dry bits behind!! I have one cat that likes both wet and dry, and another that will only eat dry. I'm so happy that you were able to find a food that you both enjoy! You know the Lapdogs are BIG Merrick fans! We love them! Merrick sounds like it makes some yummy options! We haven't tried Merrick yet, but perhaps we will look into it. Thanks for the review. Always nice when they like what they are offered! 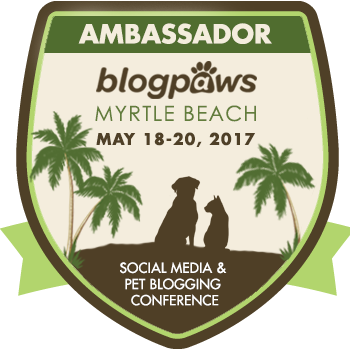 Karma-Kat loved the samples I brought back from BlogPaws! I'm a huge proponent of grain free. I don't have kitties right now, but they deserve the best. Nom Nom Nom! Looks so tasty! Food variety is always nice for pets! Looks good! Trout might be in for a food change! I am so glad you found something you like. That raw looks pretty tasty! I am looking to get something different for my cat, I think I'll try Merrick. We are fans of Merrick too! I'm glad it satisfied the wild cravings of you two ladycats! 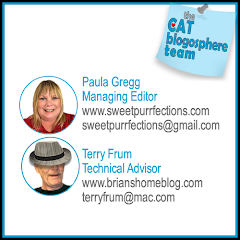 I think Dusty is planning a vist, I saw him with the atlas and a plane ticket for SweetPurrfectionsville!! I don't think you mind, being your mom her test subject! Trying out all those tasty foods :D!! It's like the best job in the world! !